Gov. 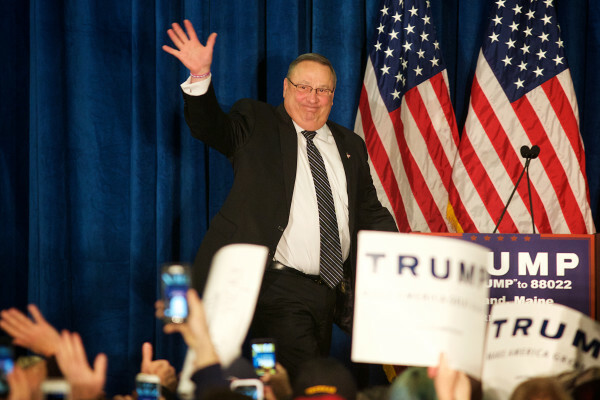 Paul LePage takes the stage at a campaign rally in Portland where he introduced presidential candidate Donald Trump, March 3, 2016. Gov. Paul LePage likes to fashion himself a fiscally responsible welfare reformer who has made long-needed changes to the state’s public assistance programs, particularly Temporary Assistance for Needy Families. He has celebrated the drastic reduction in the number of families receiving assistance through TANF since he took office. A policy he championed, a five-year lifetime limit on such assistance that took effect in 2012, is mostly responsible for the drop. Since that limit took effect, Maine’s TANF caseload has fallen 60 percent. Some 13,000 fewer children receive assistance today than in May 2012. LePage has touted the reduction as a shrewd deployment of “limited resources.” Those must be reserved “for the truly needy and those who are willing to do what it takes to get themselves off welfare into a successful future,” the governor said in a weekly radio message in September 2014. Indeed, the state has reserved those resources ever since the steep dropoff in TANF enrollment began in 2012. But it has reserved them for nobody. The LePage administration has simply let them build up and languish. Maine has more than $110 million in federal TANF funds available to it, according to the Legislature’s nonpartisan Office of Fiscal and Program Review. The money has accumulated over the last four years as the TANF rolls have shrunk and the state has paid out substantially less in program benefits. The state can only use those funds to help low-income families — and it hasn’t. This reality highlights the fact that the welfare restrictions championed by LePage aren’t rooted in fiscal responsibility. What it amounts to is neglect of the state’s poorest residents, especially children. Maine receives the same amount in federal TANF funds each year — about $78.1 million — but only after it has devoted a required amount of state money, $40.3 million in recent years, to TANF. As a result, Maine spends the money from state taxpayers first before it starts spending federal money. But with fewer recipients, the state has spent less and less of its federal grant in recent years with no change in the amount of state money it spends. The unspent federal money builds up over time and, under federal law, never lapses. A substantial drop in TANF caseloads would be worthy of celebration if it actually signified that Maine’s poorest were escaping poverty. But that’s not the case. As the number of people receiving TANF has dropped, the number of Maine children living in extreme poverty has increased; the number of children in extreme poverty has dropped nationally. The number of Maine public school students who qualify for free and reduced-price lunches has risen even as the student population overall has shrunk. And Maine has continued to lead New England in the percentage of children who live in food-insecure households. Again, the picture of food insecurity has worsened in Maine as it’s slightly improved nationally, according to the annual Kids Count survey. Meanwhile, there are substantial federal resources the state could tap to address this depressing picture of poverty. But when it comes to TANF, the LePage administration has only supported punitive measures — the five-year assistance limit that has kicked thousands off TANF; a prohibition on using TANF cash to purchase tobacco, liquor and other products; drug screening of TANF recipients and those applying for benefits; a ban on out-of-state use of electronic benefit transfer cards — instead of policies aimed at making TANF more effective for the people it’s designed to help. The governor’s most recent proposal would limit the amount of time TANF recipients can spend in education programs that prepare them for higher paying, higher skill jobs — the key to actually escaping poverty. And it unnecessarily devotes state resources to paying off federal fines when the state can satisfy its obligation to the federal government without devoting additional resources. Put together, the governor’s welfare agenda amounts to neglect — neglect of Maine children sinking deeper into poverty and neglect of TANF recipients who want to turn their lives around through education. Add in the governor’s refusal to accept federal funding to provide health coverage to tens of thousands of low-income Mainers, and LePage’s time in office has been a grave disservice to Maine’s poorest.